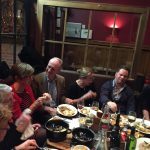 November 2017 – Earlier this year it was announced by our former committee member and vice chairman, Frank Smith, that he has decided to step down from his post. 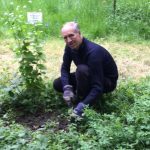 Frank has been without doubt one of the key participants in driving the Westcombe Woodlands project forward from the early days of 2011, to its current status as now being part of the Woodland Trust. Frank’s valuable contributions to the smooth running of the Westcombe Woodlands can not be underestimated, from the organisation of newsletters, funding opportunities, liaison with Greenwich Council for grants, setting up a bank account, to hosting the committee’s regular meetings, to being ever present with refreshments on the volunteer mornings and to being a regular member at our open days, it would be hard to think that without his skills and diligence the project would never have got this far. 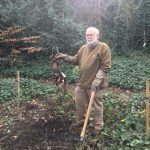 Although he is leaving his position, Frank will still be joining us on our monthly volunteer mornings and appearing on the twice yearly open days. 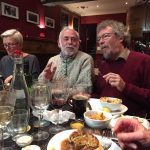 In honour of his achievements, in mid-November, past and present committee members had an enjoyable dinner in a local Greenwich pub, and as can be seen in the photos below, a good time was well and truly had by all! This entry was posted in History on January 11, 2018 by admin. 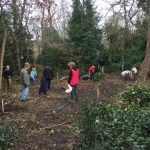 The first volunteer session of 2018 took place last Saturday morning. Despite the temperature of just 4 degrees, several committee members and volunteers arrived. 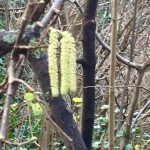 Today’s theme was to assess potential projects for later in the year, taking advantage of the dry weather and trees that have lost leaves to consider new places for new trees to be situated, as well as thoughts on new areas that can be planted up. 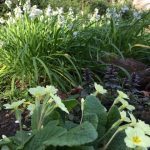 Although winter has only just started, already in places there were signs of Spring flowering plants already starting to appear, including the bluebells and primroses we’ve previously planted. 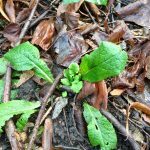 We also found a foxglove which looks like it has arrived without being planted, a good sign of the potential seed-bank in the “mini Glade” area. 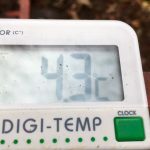 In the main Glade area, our 3 beehives showed no sign of activity, not too surprising given that the temperature was just above zero. The pond looks in a healthy state, the water level is very high, it’s quite amazing to think it’s never been topped up with additional water. 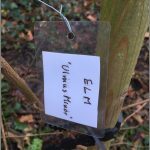 The 2 elms trees planted in the area are both doing very well, we’ll continue to monitor and report on their progress at regular intervals. 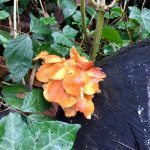 The lack of leaves on trees and bushes has allowed us to see other items which often get overlooked, including a magnificent looking variegated holly tree in the Glade area, and a bright orange fungus too. 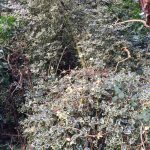 Potential projects considered were hedge maintenance, Ivy and bramble removal and new planting areas. 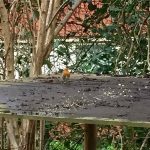 While on our mid-morning coffee break near the entrance, there were several hazel shrubs with their catkins in full flower, as well as a very inquisitive robin, looking for some crumbs! Another exciting year is in progress! This entry was posted in History on January 10, 2018 by admin. Normally we are blessed by having such good weather when we do our volunteer sessions and open days, but today looked definitely wet! But despite the greyness, a dozen volunteers and committee members turned up this morning. The leaves are finally falling and turning yellows, browns with the odd red here and there. When you arrive in to The Glade, the large lime tree immediately as you enter looked magnificent, leaves falling to the ground but still with plenty of colour. 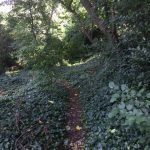 The below photos show leave covered footpaths, along with the autumnal atmosphere. 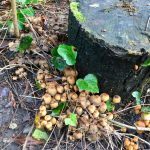 Fungi on rotting wood can be seen now, a good sign that the local ecosystem is at work, recycling nutrients that can be found. 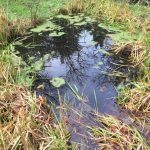 The pond, despite a bit of pondweed on top continues to look healthy, there was the sound of something jumping in the water when the pond photo was taken. It’s a tribute to how well it was built in that it’s never needed to be topped up with water in the 18 months or so it’s been in place. 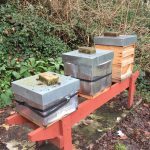 And despite the cold and wet weather, there was a fair bit of bee activity around the hives too. 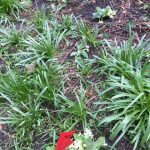 The usual weeding took place, with bramble behind the wildflower area in The Glade taking a pounding, but also bluebells and 10 Solomon’s Seal bulbs were added. The cold an wet weather didn’t slow down the progress here! This entry was posted in History on November 14, 2017 by admin. Last Sunday saw another very well attended volunteer session with over a dozen committee members and volunteers tackling this month’s tasks. 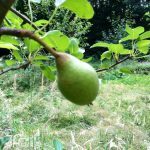 It was disappointing to see that all the pears and apples had been taken by, we assume, local squirrels. 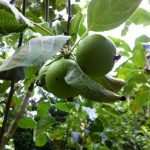 Last month we saw around a dozen potential fruits which were looking good, but others got there first! 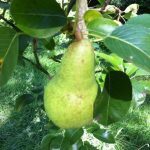 Pear tree, but without the pears! 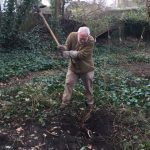 One of the main tasks was the weeding of The Mound area, which had become very overgrown with bindweed, plants working their ways around the small tree saplings. 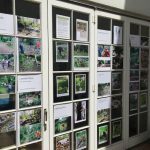 You can see in the photos the impact of 2 hours’ work on the area. 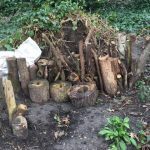 At the entrance area, some of the branches from the immediate area were moved and, if required, cut in to smaller pieces to create a new dead-wood habitat, while making the area tidier too. With all the work taking place, it’s often we forget to appreciate the inside of the woodland, even the footpath in the dappled shade offering a little quietness despite housing being no more than 30 feet away from the paths. 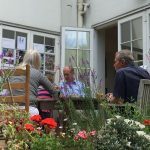 And it’s always appreciated that a coffee break allows us to chat and discuss new ideas and projects, especially with next month’s open day. 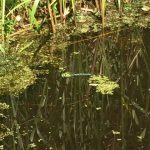 Finally, just before leaving, in the pond area, we saw what we think is a Southern Hawker Dragonfly, one of the more common dragonflies in Southern England and commonly associated with small ponds. This entry was posted in History on September 6, 2017 by admin. Last Sunday morning saw another weekend volunteer morning session. Although volunteer numbers were low because of the Summer holidays, we welcomed new faces and undertook many tasks. 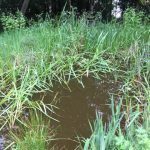 The pond was becoming a little overgrown with the grasses at the edges making most of the Summer warmth. 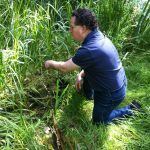 As can be seen in the photos committee member Donald Albrecht and 2 other volunteers get to grips by removing grasses to create a more open water area. 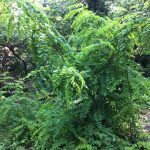 Also involved with plant removal, non-native Locust Trees (Robinia pseudoacacia) have been removed from the woodland, with their hard timber making excellent seats in the glade. The species grows fast and is invasive. One was growing in the open area on the way to The Glade, but as can be seen in the photos, it was swiftly removed. The grass in The Glade area is also growing quickly, especially with the heavy rains of last week. We bought a scythe and this is extremely useful in such a small area. The photos show it being used to full effect! 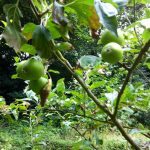 Finally, the fruit trees in The Glade show that the apples have been eaten by, no-doubt, squirrels and birds, but the pears don’t seem to be of interest and we may have a small harvest next month! This entry was posted in History on August 15, 2017 by admin. 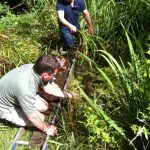 The first volunteer session of Summer took place the 1st July. Numbers of volunteers were a little below normal, but this didn’t reduce the enthusiasm of the people who were present. We also welcomed 2 new people who had never been to the Woodland before. 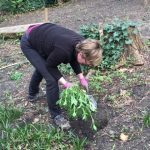 We concentrated on the usual weeding of the areas around The Glade in preparation for the up-coming revisit from the volunteers at Barclays Bank over in Canary Wharf. 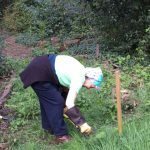 It is a year since their help was used to dig the pond in The Glade area. As can be seen by the accompanying photo of the pond, it is impossible to think that this is such a recent addition. It’s also remarkable that the water has never been topped up, it’s just rainwater that’s in the pond. 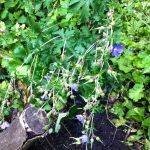 The area to the east of the flower bed saw many ruderals starting to develop, mostly hogweeds. 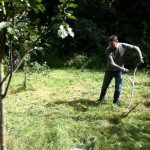 Using the scythe, extra weeding was undertaken here. 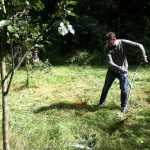 Also the scythe was used to trim the grass around the pond area. 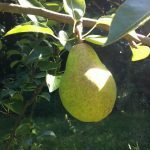 Other photos show how the fruit trees were really putting on a good display this year; it remains to be seen if any will make it to mature fruit before squirrels and birds start to eat them! This entry was posted in History on July 12, 2017 by admin. 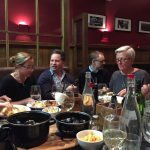 Successful Summer Party! 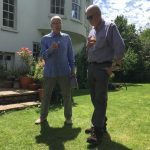 On Sunday 11th June, members of Westcombe Woodlands were once again invited to come along and enjoy the wonderful hospitality of Chairman Tim Barnes’ home. 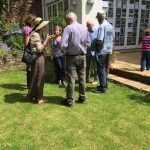 It was an opportunity for all to enjoy refreshments and to chat among other members of achievements in the past and to discuss upcoming events and activities, all in Tim Barnes’ garden. Only a week after our 4th Open Day event saw us back to our usual routine of the monthly volunteer events. Over a dozen people helped out with today’s tasks. The weather is really starting to warm up now, so extra watering of our new planst is required. 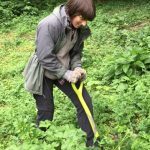 Of course, this means that the weeds we try and keep at bay are also rapidly growing. The “Mound” area was also weeded to. 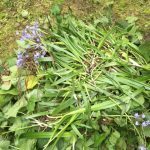 One of the more unusual weeds we were removing was Spanish bluebell. 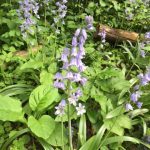 This plant is a threat to our native species because it readily cross-breeds resulting in the fertile hybrid, which is a problem because crossbreeding dilutes the unique characteristics of our native Bluebell, changing future generations forever. The Spanish bluebells are a very common garden plant and are quite invasive in the right growing conditions. They are characterised by having little or no scent at all and are generally a much paler blue that the strong blue of our native bluebells. 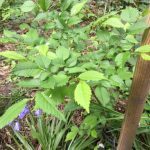 One of the woodland’s more interesting plants we have aquired are some Elm saplings. 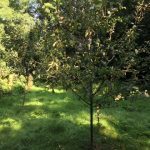 These have been especially grown with the hope of offering resistance to Dutch Elm disease. 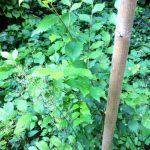 As can be seen in the photo below, this small sapling is looking very healthy. 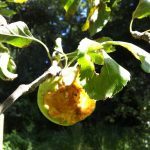 The tree can grow up to a height of around 20 feet before the beetle that spreads the fungus through the tree starts to cause the tree to weaken. It will take many years before the planted saplings reach this size. Finally, our recently constructed pond is going from strenth-to strength. 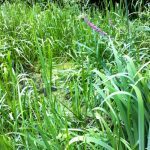 The pond’s margins are looking very impressive, with the grasses and plants looking very healthy. This entry was posted in History on May 12, 2017 by admin. 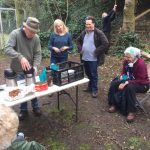 Our first volunteer session in Spring was a wonderful day. Blue skies, warm temperatures and no wind made the outside conditions seem almost balmy for this time of year. This meant we could really get stuck in to the tasks of planting and weeding. 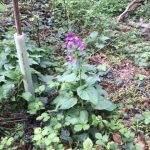 Using funds from previous open days, we purchased more native plants to further enhance the existing woodland flora. 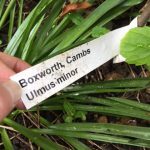 With the warmer temperatures, now is the ideal moment to new plants in before the soil starts to dry out, making it less likely plants will survive. 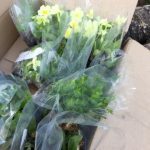 Having purchased new plants, we also took existing plants such as established clumps of primroses and red campions and divided these in to smaller plants. 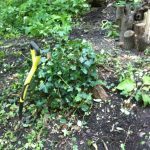 An economical way to increase the woodland flora. However, there’s always a requirement to keep on weeding. 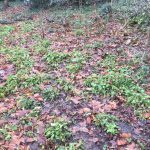 The Glade area has a lot of bindweed, and this plant needs to be kept under control. 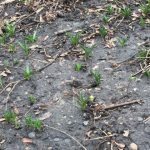 Although planting was a good activity, it’s also nice to look at the existing plants that are only just starting to grow. The mature pear tree in The Glade area was in full bloom with white petals covering the immediate area. 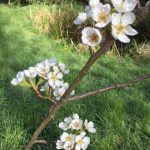 The other photo shows apple blossom also in full flower in the orchard area of fruit trees. 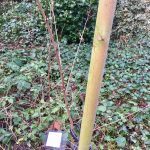 In The Glade area, we bought some more native hedge saplings and it was now the time to get these in to the ground so that they can take full advantage of the extra light and warmth. The hedge in the area around the newly created pond will be a valuable wildlife habitat in the future. 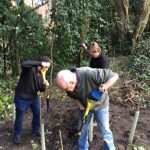 The photos below show volunteers working away to create the holes in the soil for the new hedge saplings to be put in to place. This entry was posted in History on April 10, 2017 by admin. 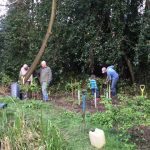 The 3rd Volunteer Morning of the year had a definite feeling that Spring isn’t far away. 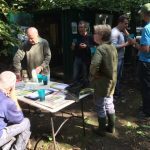 The event was very well attended with both committee members and volunteers, with around 18 people onsite. 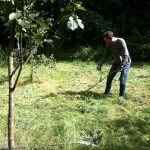 Tasks this morning were the removal of a non-native horse-chestnut tree to make way for native woodland saplings including English Oaks. 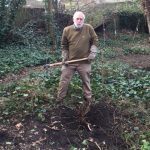 The photos below show committee member Andrew Slade with a mattock taking aim at the horse-chestnut, to remove it from the newly created woodland clearing on the way to The Glade area. 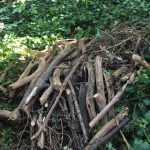 Further work was the addition to the stag beetle dead wood habitat. 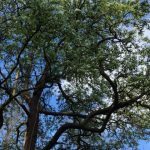 This will be mentioned in the Spring newsletter, but work was started last month on the creation of a fixed potential habitat for this greatly declining species. 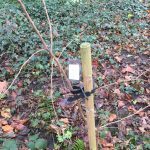 Fortunately one of the species’ strongholds is in south east London; we hope this effort will add to their numbers as shown in the photo below. 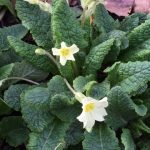 It was very encouraging to see the primroses we planted a few years ago in flower, as well as some of the snowdrops that were planted just several weeks ago. 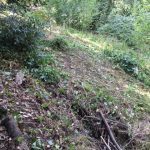 No doubt this time next year they will be even more established, providing a pleasant site to the footpaths with their early flowering season. 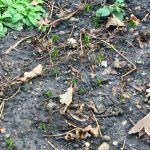 In addition the several hundred bluebells that were also planted towards the end of last year are already starting to make an appearance. 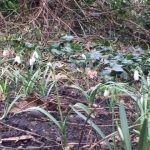 The below photo doesn’t look very significant, but the bulbs have been in the ground for just over 3 months, so clearly the habitat conditions are ideal. Hopefully by the end of April there should be a good display of flowers. 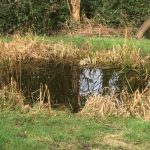 The pond is looking well, it’s full of water and although there doesn’t appear much activity, no doubt in the next few weeks it will be a place coming in to life. 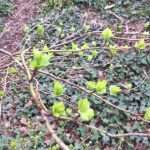 Finally, bright green leafs are already starting to open. 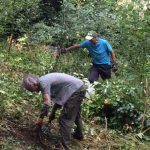 Finally, the last 2 photos show volunteers both at work in the new clearing removing ivy, bramble and adding to the log piles for insect habitats, as well as enjoying a well deserved coffee break! This entry was posted in History on March 5, 2017 by admin.